Funstacle Course is a Bowser minigame from Mario Party 7. Its name is a pun on an Obstacle Course. In this minigame, three Koopa Kids chase the players. 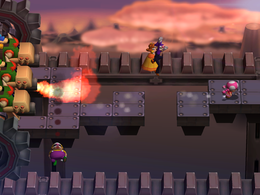 The players must dodge obstacles while running away from them. The first obstacle is a bunch of Thwomps. After that, there are three platforms moving vertically up and down. The third obstacle is an area with spiked bars going toward the left of the screen. Finally, the Koopa Kids start shooting fireballs. Players who make it to the finish line win. Rules – "Reach the goal by running through a series of diabolical Koopa Kid traps!" Advice – "The traps are both clever and diabolical! Be on your toes!" This page was last edited on May 22, 2017, at 16:37.